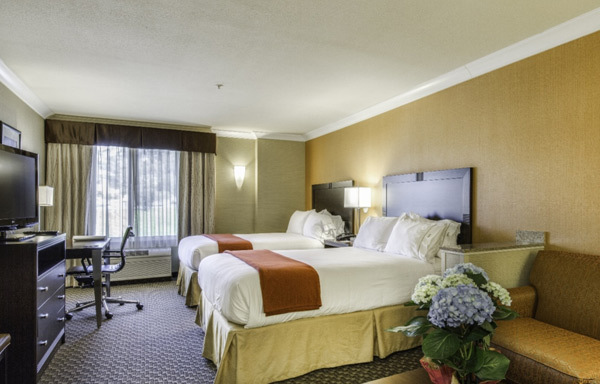 Treat yourself to a refreshing lodging experience at Holiday Inn Express Castro Valley. 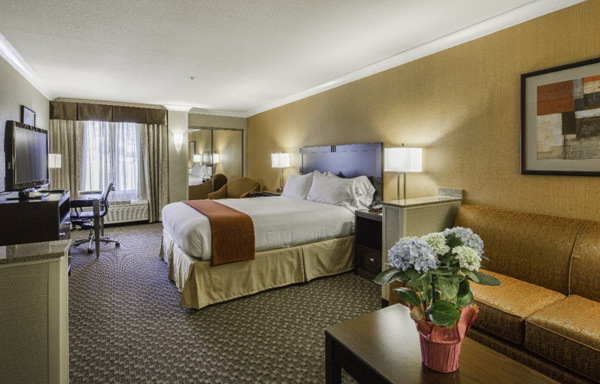 Our renovated property near San Francisco features comfortable rooms with a myriad of amenities. Equipped with two queen beds or one king bed, these spacious accommodations can easily handle your large group. And as an ADA-compliant hotel, we provide options for our physically challenged guests. Disclaimer: All reservations must be guaranteed by a valid major bank issued debit/credit card. Our hotel does not accept cash upon check-in, however, guests have the option of paying cash upon check-out. Must be at least 21 years old to check in. Rules and restrictions may apply to certain rates, amenities, and room types. Extra person charges will apply after 2 guests. Discover one king bed with a Serta Elite plush mattress, an ADA accessible bathroom, and many enticing extras. In addition to a refrigerator, microwave, 37-inch flat-screen HDTV, and free Wi-Fi, you’ll enjoy a designated seating area with coffee table and sofa. Two queen beds with Serta Elite plush mattresses and a designated seating area with coffee table and sofa are just the beginning. Modern conveniences range from a microwave and refrigerator to a 37-inch flat-screen HDTV and complimentary Wi-Fi. One king bed with a Serta Elite plush mattress plus a designated seating area with coffee table and sofa bed add up to one very pleasant accommodation. Creature comforts include a refrigerator, microwave, 37-inch flat-screen HDTV, and free Wi-Fi. More room to roam is the hallmark of this large corner room. 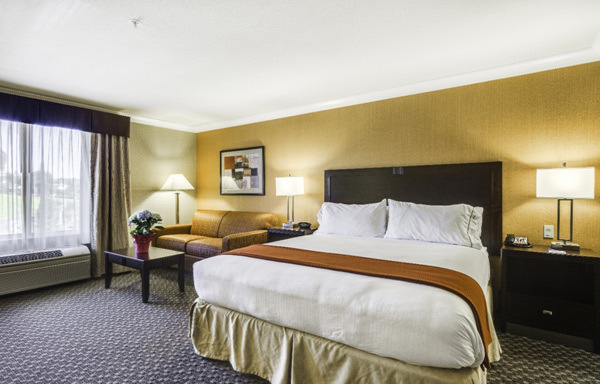 Delight in one king bed with a Serta Elite plush mattress, designated seating area with coffee table and sofa bed, free Wi-Fi, 37-inch flat-screen HDTV, and refrigerator. 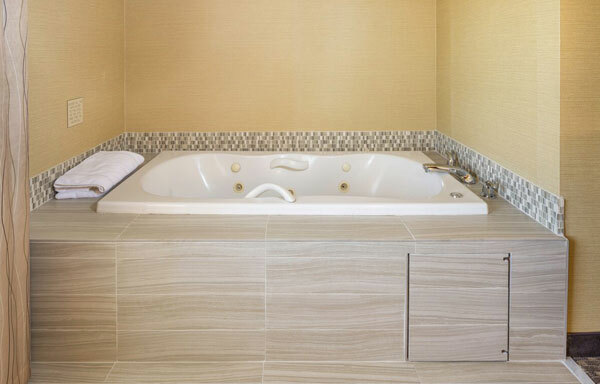 Couples seeking a romantic getaway will want to seek out this accommodation whose main attraction is an inviting Jacuzzi tub. A king bed with a Serta Elite plush mattress, refrigerator, 37-inch flat-screen HDTV, and vanity mirror are some of the additional highlights. 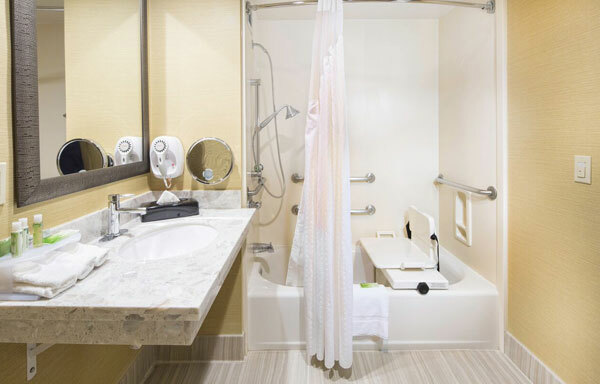 You’ll be treated to two queen beds with Serta Elite plush mattresses and an ADA accessible bathroom. There’s also a designated seating area with coffee table and sofa bed along with a refrigerator, microwave, 37-inch flat-screen HDTV, and free Wi-Fi.